Sometimes we see so much negativity in the news and on social media that we forget about all the positive things that happen – that’s why we started One Good Thing a few months ago to focus on successes of our members. This week for One Good Thing, we will be focusing on some of the recent successes UTEC, in Lowell, MA has experienced. Fall has been a busy season for them! In the last few months they’ve become one of 10 partners with the Ascend Network and will join the Aspen Family Prosperity Community. Joining Family Prosperity will make it possible for UTEC to share their experience and results with practitioners across the US to help make a path to a stable future for kids and their families. In October, UTEC worked with an ad agency in Boston to create a new brand name for products they sell. 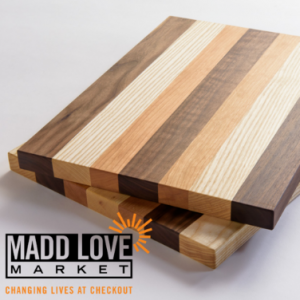 “Madd Love Market,” is the new name that will appear on cutting boards that UTEC sells in Whole Foods stores in the area. They will also have products such as almond nut butter and peanut butter displaying the new name that will be available early next year.